We would feel guilty or uneasy others using our computers when we are near it or away from it, we feel uncomfortable for that any valuable data’s in our computer may be operated by others not even more but just using basic functions (cut, copy, paste or delete) making the situation shattered. At times we may even hesitate to restrict them doing all those things. But now you can prevent all this things by just using utility ‘Prevent” a freeware app which will not allow other users to operate with this functions on any a Windows computer. 9. Disables Task Manager’s End Process button. Also it doesn’t allow you to right click on process name and click on end process. 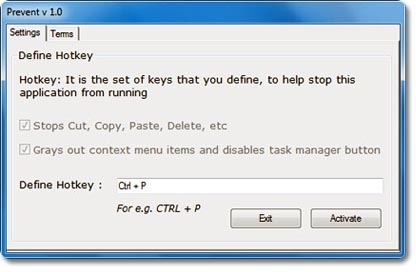 It also grays out the context menu items, disable Ctrl+C, Ctrl+X and Ctrl+V and/or stops the process.